Just a blog about two kids learning about renovating the hard way. Whilst waiting on the settlement of our new purchase, we have taken the chance to hunt for the perfect pieces of furniture for our new pad. Apart from a bedroom suite and a lounge (which we are inheriting), we are starting from scratch. Additionally, as many couples with a new property who are coming to terms with paying a dreaded mortgage are, we’re on a tight budget! So armed with a clenched fist of cash and not wanting to give any away unnecessarily, we have been out and about searching for deals and bargains for some of the necessary big ticket items we need to kickstart out time at the cottage. 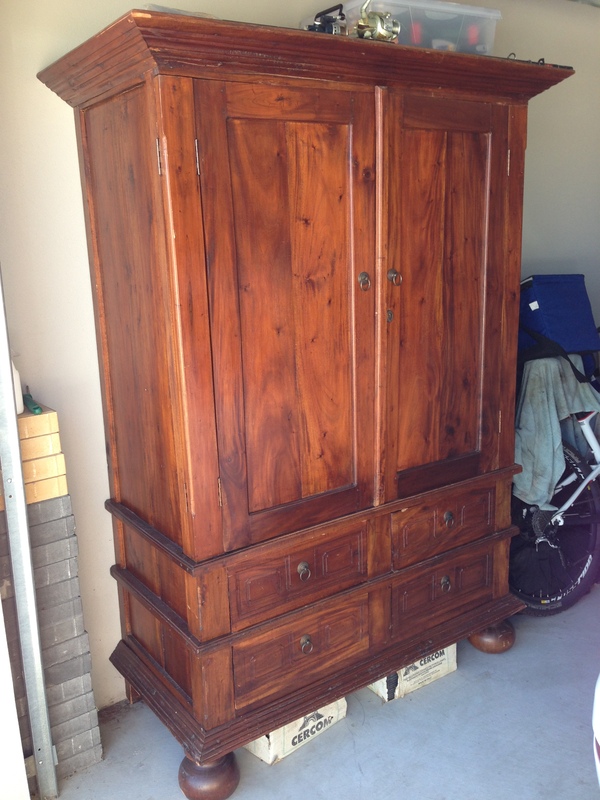 One of the most pressing items on the bargain hunting list was a free standing wardrobe. Given the vintage of the property, storage is, and will continue to be, a key focus in adequately renovating and redesigning our house. But tell me, have you tried buying a wardrobe recently?! I’m guessing that you haven’t. It is the sort of furniture that you might come across at nanna’s house and might never have thought about twice. However, let me assure you that if you are sitting on a well looked after freestanding wardrobe, you are actually sitting on a small mint! Aside from the flat-packed versions you might find at Ikea, timber freestanding wardrobes are difficult to find brand new and they’re expensive! Understandably I guess, given that there is little use for them in houses built in the last few decades. The search has taken us quite literally across the City from op shop to op shop on the hunt for the perfect wardrobe. From Guilford to Morley to Bibra Lake to Fremantle, you name it – we’ve probably been there! Op shopping for furniture is tough as many op shops aren’t large enough to stock copious amounts of big furniture pieces. However, if you are in the market for furniture and are keen to check out some secondhand stores, here are my recommendations in Perth. Rags to Riches – talk about furniture overload, these stores are definitely my first recommendation for anyone in the hunt for the perfect piece, unless you are in any way claustrophobic. There is wall-to-wall and ceiling-to-ceiling (I wish I was kidding but I’m not!) treasures if you are prepared to wade through the chaos. Though there are a number of them around, I can personally vouch for 7-9 Rockingham Road, Hamilton Hill and 16 Port Kembla Drive, Bibra Lake. The store at Bibra Lake even has a additional warehouse storage area out the back filled with bargains – just try not to get disappointed when you notice ‘sold’ stickers on the something perfect and remember to get in quick if you see something you like. Russell Street, Morley – though the collections were smaller, in both the Anglicare and the Salvos stores (located across the road from one another) we found some of the best kept treasures in op shopping history. In the Salvos store for instance, there was a pristine, vintage brown leather couch on carved wooden legs with gold studded details – which we would have totally taken home had we not already had a couch! And in the Anglicare store was a delightful white dressing table with a glass top and three piece mirror. Another piece I would have gladly taken home, had I have been persuasive enough to convince the boy I needed it (I really need to work on my game!). Port Care Op Shop – located at 372 South Street, O’Connor this is where we eventually, after a number of weekends of me dragging the boy from op shop to op shop, found the perfect wardrobe. This delightful store had a surprisingly large supply of wardrobes and we have managed to pick up an East West Design wardrobe in reasonable condition for the bargain price of $290. With large double doors and four deep draws, this little beauty matches our bedroom suite almost perfectly and will be a welcomed addition to our new bedroom. In other bargain hunting news, we have also managed to score some brand new furniture from a liquidation sale advertised in the West Australian newspaper (thanks mum!). For the very low price of $850 inclusive of delivery, mum and I trawled through the Prime Liquidations warehouse to buy a buffet, treasure chest coffee table, television cabinet and side table. Despite being a little bit ‘different’, these pieces will suit our house to an absolute tee, will add burst of colours and look exceptional against the jarrah floorboards which are such a feature in the house. Whether new or secondhand, there are furniture bargains to be found all over the place. Keep your eyes peeled for listings in the paper, on the web and on Gumtree and frequent op shops and garage sales. Like they say, one mans trash is another mans treasure! And sifting through all the ‘trash’ is half the fun! The importance of doing your homework.